Since TRUE BLOOD is drawing to a close, I thought about some of those other vampire series in the last decade or so that didn’t last quite so long. This short lived show was derived both from the comic books and the movies. It starred Kirk Jones as Blade and Jill Wagner as Krista Starr an ex soldier who joins Blade in taking down vampires. Nelson Lee was cast as Blade’s assistant/tech genius type of person, Shen. It did well in the ratings, but was not renewed for a second season, the official reason being the cost for the then fledging network. Actually, I rather enjoyed BLADE: THE SERIES. I had somewhat of a post-apocalyptic look. It wasn’t a fantastic series, but I thought it had potential. I enjoyed Jones’ Blade portrayal more than Wesley Snipe’s movie portrayal, actually. (apparently Snipes was going to be in the TV series, but the deal fell through).Towards the latter episodes, however, there was sharp change in tone to more of an Anne Rice type gothic vampire style which didn’t bode well. How it would have played out was anyone’s guess. BLOOD TIES was based on Tanya Huff’s enjoyable paranormal series’. There are differences, but I liked the television adaptation. Christina Cox plays Vicki Nelson-an ex-cop forced into retirement due to a disease that is destroying her vision. Christina Cox had played guest parts on many shows (DEXTER, STARGATE). She was also in CHRONICLES OF RIDDICK and in her career as a stuntwoman did boxing stunt work for Hilary Swank in MILLION DOLLAR BABY. Christina Cox is practically her own superhero. Kyle Schmid plays the vampire Henry Fitzroy, based on the historical figure of Henry Fitzroy, Henry VIII’s illegitimate son. I loved Kyle Schmid’s vampire. I thought he was a wonderful and the sexual tension between him and Vicki, always implied, but never acted on, was great. Huff’s books tend to be detailed and well-researched; taking well-worn tropes and makes something new. The series had a lot to draw from. I was very disappointed when it was cancelled. 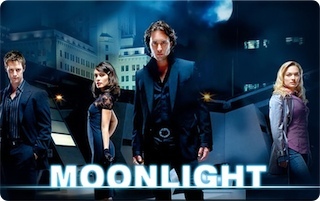 MOONLIGHT was another short lived contribution to the vampire show cannon, starring Alex O’Loughlin before his HAWAII 5-0 days. He may be easy on the eyes, but he wasn’t terribly impressive as a vampire. It’s never quite convincing. He comes across as just a regular guy with a special diet of blood and that’s about it. Mick St. John is a private investigator turned into a vampire on the night of his wedding by his bride, Coraline. Beth Turner(Sophia Myles) is a internet reporter who helps him solve various cases and has an old connection to Mick though she doesn’t realize it. It’s not a terrible show, but it doesn’t stand out. Still, there are a few good moments; the episodes are watchable; and if you just kinda have that hankering for anything with a vampire watching a few episodes of MOONLIGHT won’t hurt. ← Guarded – Pre-Order Feature! I liked Moonlight a lot. I was surprised when it was cancelled as it was one of the very few shows for which the network ordered extra episodes after the WGA strike. Now I feel like rewatching it! I forgot about the writer’s strike. I’m sure that had an effect on the show. Have fun with a rewatch. I loved BLOODTIES big time! Henry was just fantastic. Vicki was cool. So wished that show lasted longer. Loved Moonlight! back in the day. Another MOONLIGHT fan:) maybe I show give it another chance. Some good Choices here. I am fan of two out three. Somehow I miss Blade: The Series. Don’t know why. Loved the Blade movies. I will have to check that out. What did you miss? Forever Knight was another of my favs though rather campy in cheesy kind of way. And then there was Dark Shadows The Revival – a well done remake that was never given a chance. I was impressed with it considering the shoes it had to walk in. Thanks for those two. I had no idea about the Dark Shadows revival. Forever Knight was an influence for the BLOODTIES TV series, so I’ve heard. Dark Shadows Revival happened the same time as Dessert Storm. They said ratings couldn’t compete with live action so it only had about 12 shows. I am a huge Dark Shadows fan and I missed it at the time. I found it on Amazon and bought it and was pleasantly surprised at how good it was. Shame it couldn’t compete at the time. Don’t forget Kindred: The Embraced. That series had a lot of potential and got snuffed out way too soon. I own the Blood Ties series. I was very unhappy when they ended it where they did. Fun Fact: Kyle Schmid (Henry Fitzroy) also played a vampire named Henry in the US version of Being Human. I don’t think I ever saw any of these. I did like the Blade movies and I loved the one season wonder, The Gates, right up until the end, then what a terrible last episode. Ugh. I hadn’t heard of THE GATES. Thanks for highlighting that one.